For most common meteorological variables, a variety of methods exist for measurement. Wind is no exception and given the plethora of available anemometers ranging from mechanical to ultrasonic, it can be difficult to determine which sensor is right for your application. This quick overview will give you the basics to point you in the right direction. Cup – Consists of several (usually 3) small cups connected to a central axis. Wind speed is measured via the speed of rotation. Helical (propeller) – Measures wind via rotation of a propeller that must be oriented into the wind. This is typically accomplished by mounting the propeller on the front of a wind vane. Ultrasonic – Ultrasonic pulses are used to measure both speed and direction without the need for moving components. Every instrument will have slightly different behavioral characteristics. These include accuracy, minimum wind speed measurement, and instrument response to rapid changes in speed and direction. Cup and helical anemometers tend to have similar characteristics. These mechanical anemometers are both typically less responsive to rapid (< 3s) changes in wind than ultrasonic devices. However, for most general meteorological measurements, mechanical instruments are sufficient and may even be preferable due to increased simplicity of use. An ultrasonic instrument is more commonly used for specialty high frequency measurements related to eddy covariance. Electrical characteristics also vary across instrument types and manufacturers. Total power requirements will depend on sensor type and processing. Some instruments have built in heaters that minimize icing, but may require temporary periods of very high power draw, which is a burden on remote solar powered stations. Instrument signals can be either analog, such as resistance or frequency, or digital data like Modbus. Digital signals are more resistant to degradation associated with long cables, but processing must take place on the sensor. Processing of the measurement on the sensor may actually be a benefit as it reduces the processing that must take place on the data logger. The instrument deployment location is also an important consideration. Weather extremes will test even the best instruments, but high quality craftsmanship will go a long way to preventing freezing of any mechanical components, solar degradation, dust intrusion, and corrosion. When located in inaccessible sites such as mountainous environments, robust designs may be required in order to be reliable. Instrument quality varies widely across manufacturers, so review instrument tests if available. Finally, consider your budget for both up front cost and maintenance/repairs. High quality ultrasonic sensors are going to cost more up front due to electrical components and data processing. However, high frequency measurements are often not needed in a basic weather station. Some instruments may require costly yearly calibration by the manufacturer. So how does the Dyacon Wind Sensor compare? 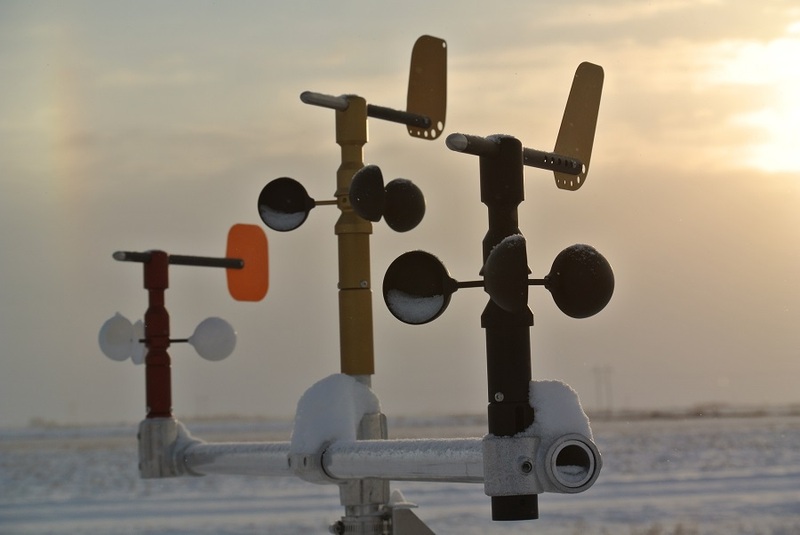 Our WSD-1 is a rugged three cup anemometer coupled with a wind vane. The low-power onboard electronics provide multi-parameter output including real-time gust detection and 0.1 m/s resolution with industrial Modbus output. It has a proven track record with successful multi-year testing in mountainous environments and requires minimal maintenance. Power draw is substantially less (~1/10th) than that of other sensors with on-board measurement processing. On-board 2 minute and 10 minute averaging of wind measurements simplifies datalogger programming and further reduces system power requirements.